Manchester City striker Kelechi Iheanacho is one of five Premier League players named in Nigeria's squad to face Egypt in two Africa Cup of Nations qualifiers this month. Nigeria coach Samson Siasia has also picked West Ham's Victor Moses, Watford's Odion Ighalo, Chelsea's John Mikel Obi and Arsenal's Alex Iwobi in a 20-man group of overseas-based players. Siasia is in temporary charge following Sunday Oliseh's resignation. The Super Eagles play Group G rivals Egypt on 25 March in Kaduna and in Alexandria on 29 March. Nigeria are two points behind leaders Egypt after two rounds of matches with only group winners guaranteed automatic qualification to the tournament in Gabon. 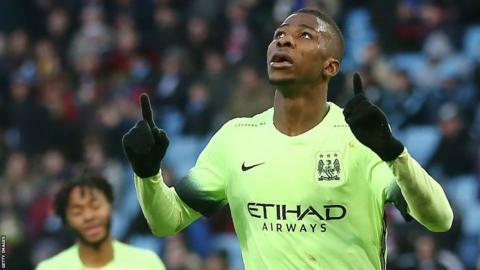 Man City's Iheanacho, who made his debut against Swaziland, has been rewarded with a recall following his nine goals in 24 appearances for his English club this season. West Ham winger Moses starred as Nigeria clinched the 2013 Africa Cup of Nations, but his search for consistency on the international scene has been hampered by a series of niggling injuries. His last Super Eagles appearance was in the 2-0 loss to France at the 2014 World Cup. Former England youth international Iwobi is in line for his first competitive game and follow in the footsteps of his uncle and former Nigeria captain Austin Jay-Jay Okocha. The 19-year-old has only made two substitute appearances against DR Congo and Cameroon in a friendly but he was on the bench for the 2018 World Cup qualifiers against Swaziland in November. Lazio midfielder Ogenyi Onazi is suspended for the first game in Kaduna after he received a straight red card against Chad in June 2015. Fanendo Adi, who plays for MLS champions Portland Timbers, has been handed his first call-up. Defender Leon Balogun, who has been in excellent form for Mainz in the German Bundesliga, had been originally left out but was added to the squad on Friday. Siasia will open camp with the locally based players in Abuja this weekend.